A very interesting topic came up today in the M263 Student Cafe on FirstClass. This was Microsoft's new programme called Dreamspark which basically is an extension to the Microsoft Academic Alliance programme which Microsoft runs for universities. The Dreamspark programme is aimed specifically at developers and provides free fully licensed copies of Microsoft products such as Visual Studio 2008 Professional Edition, Visual Studio 2005 Professional Edition, SQL Server Developer Edition and lots, lots more. Many of these products cost upwards of £500.00+ and as I'm sure many of you will be aware these are products that companies run s there development environments (mine certainly does). So whether its to learn to use the software, get a heads up on the environment or just get a license to a great piece of software make sure you take a look. Below is a quick guide about how I went about getting my copy of Visual Studio 2008 Professional Edition. 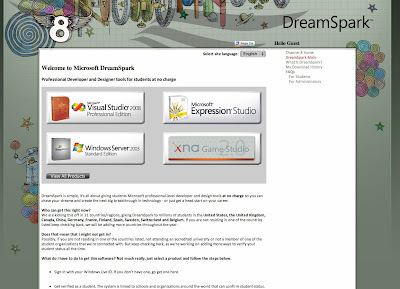 Visit the Dreamspark site HERE. You will be greeted by the site above. Have a little look around at what is on offer and then click the get started button at the bottom of the page. The following image will appear. 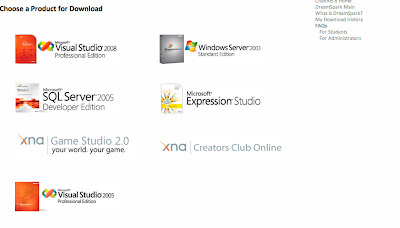 As you can see it shows you all the products available for download, these range from Windows Server 2003 and Game Development, to copies of Visual Studio Professional, SQL Developer and Microsoft's Expression Studio Suite of Graphics and Web Design Products. Click on the product that you would like to download by selecting its image. 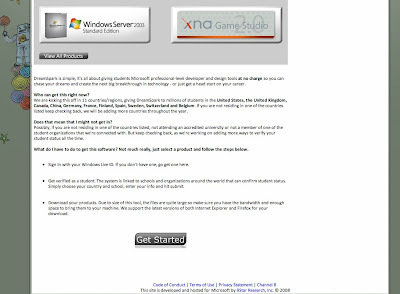 In this example I have chosen to download Microsoft Visual Studio 2008 Professional Edition. I am then asked to begin the verification process to confirm I am actually entitled to download the software (prove I'm a student). Click the Sign In button and log in with your Windows Live ID. If you don't have one then just click where it says Sign up for a Windows Live ID. 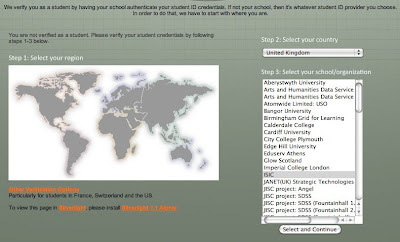 Once you are signed in you will have to select your Country from the download list and select your University. As the OU does not appear to be registered for the programme at the moment (they may choose to in future) we are going to select ISIC from the drop down list of universities ( You must have an ISIC Card or an Open University NUS EXTRA card see my entries HERE and HERE if you need to get one). Now all you need to do is download your software, tick to accept the terms (read them first of course) and then click to download. Click the Get Key button in order to obtain your License of the product, which as far as I am aware is yours to keep. Once you have downloaded install the products and away you go. Good luck! I hope you benefit from and enjoy using the software. Response received from the Dreamspark Team. Thank you for contacting ISIC. We are thrilled that you are taking action with DreamSpark! 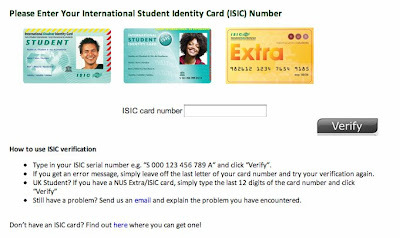 If you are a current NUS ISIC holde, please make sure to prefix an S before your last 12 digits. Thanks for the info, I was having *fun* trying to get my ISIC number from my extra card to work. PS I agree with your comments on M255, I'm just finishing TMA04 and it's been a great course. No problem, looks like the OU picked up on this offer and posted it in the messages section of Student Home. Glad the blog helped sort the issue, it beat me the first time I tried. Glad to hear M255 is coming to a close, let me know how you get on in the exam. Will be starting M150 this October and I'm also heading for a BSc in Computing. Just like to say thanks for upping some great info. As soon as I get my ac email address I'll be getting the NUS Extra card and VS 2008. 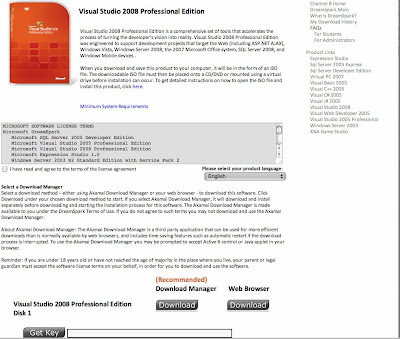 I can get Office 2007 through the Home Use programme for a tenner, so should be all geared for some serious VSTO development. But at the same time I'd like to get started on Java, can you recomend any good books or web sources? My background is vba only so I know it's going to be a shock learning a proper language be that vb.net or Java.